Émile Friant (1863–1932), All Saints' Day (1888), oil on canvas, 254 × 334 cm, Musée des beaux-arts de Nancy, Nancy, France. Wikimedia Commons. He’s been called the Last Naturalist, and like many of the Naturalists whom I have featured here, was both popular in his day and almost forgotten now. Émile Friant (1863–1932) rebelled against the academic style of the 1880s, and is one of the major artists discussed by Richard Thomson in his account of French painting between 1880-1900 (see below). He was born in the far east of France, in the town of Dieuze, not far from the modern border with Germany. His father was an artisan, a locksmith who was also commissioned to design bespoke clothing, and his mother a dressmaker. Fortunately, he acquired second ‘parents’ who were more affluent, and being childless themselves, looked after him as if he were their own. When Prussia defeated France in the war of 1870-71, Dieuze became lawless and was annexed by Prussia. In 1871/72, Friant fled with his adoptive mother to Nancy, and his biological family followed. He did not fare well in academic subjects, but showed an early aptitude for art, so he was taught still life and landscape painting in Nancy. He showed his first works locally in 1878, earning himself financial support to go to Paris and apply to the École des Beaux-Arts there for admission. He was successful in that in 1879, and there studied in the studio of Alexandre Cabanel, where Jules Bastien-Lepage, Henri Gervex, Henri Regnault, and Benjamin Constant had studied previously. Friant’s time with Cabanel was not happy, and he emerged a bitter critic of academic painting and the École system. He entered the Prix de Rome in 1883, but had to settle for second prize. As was so often the case, there were suggestions that Cabanel and others had arranged for their favourites to be successful there, and in the Salon. 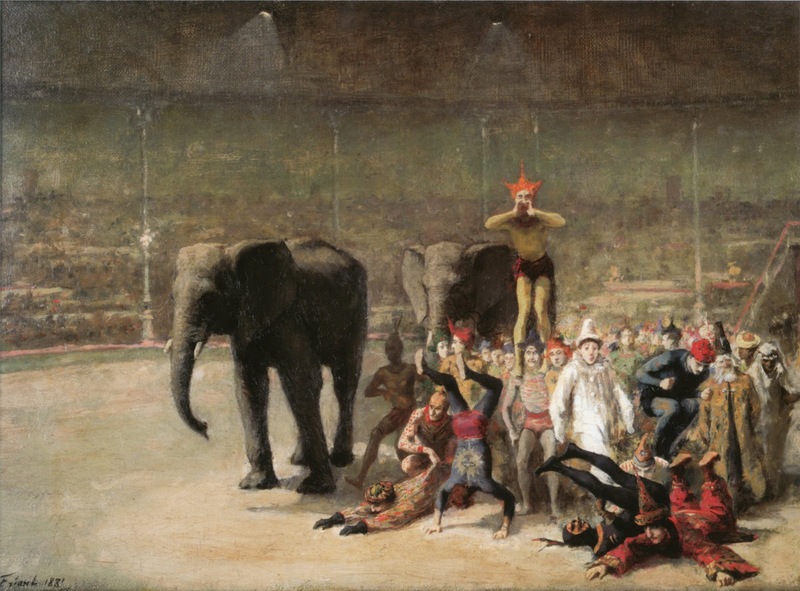 In these early years, several of his surviving works are mythological, but his 1881 painting of The Entrance of the Clowns stands out with its unusual theme, which is associated with other Naturalist art. It shows the interior of the ‘big top’ of a circus, at the moment that the clowns, acrobats, and other entertainers parade. 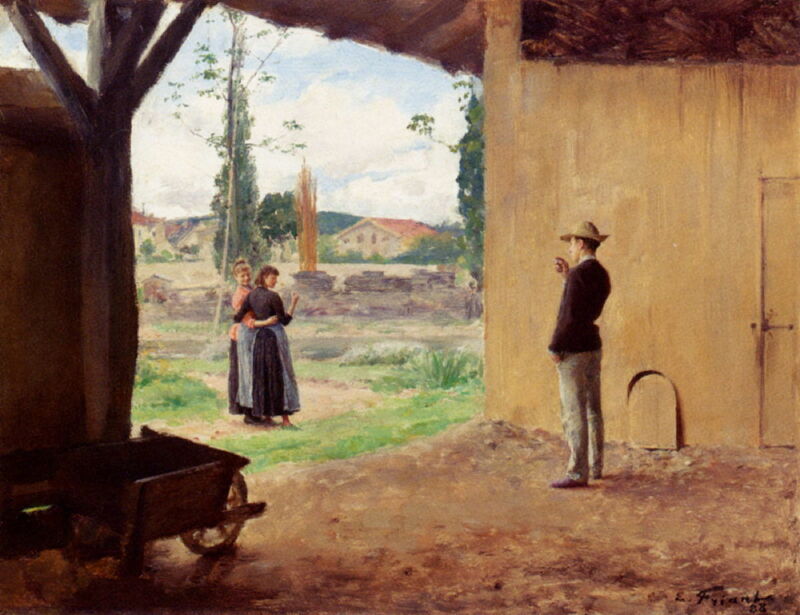 Friant demonstrates that he has already acquired the technique of putting the foreground into relatively sharp focus and detail, and leaving the background blurred and sketchy, as may have been influenced by photography. Friant first exhibited at the Salon in 1882, but after his disappointment in the Prix de Rome the following year, he returned to set up his studio in Nancy. Émile Friant (1863–1932), The Drinkers, or Monday’s Work (1884), oil on canvas, dimensions not known, Musée des beaux-arts de Nancy, Nancy, France. Image by Ji-Elle, via Wikimedia Commons. 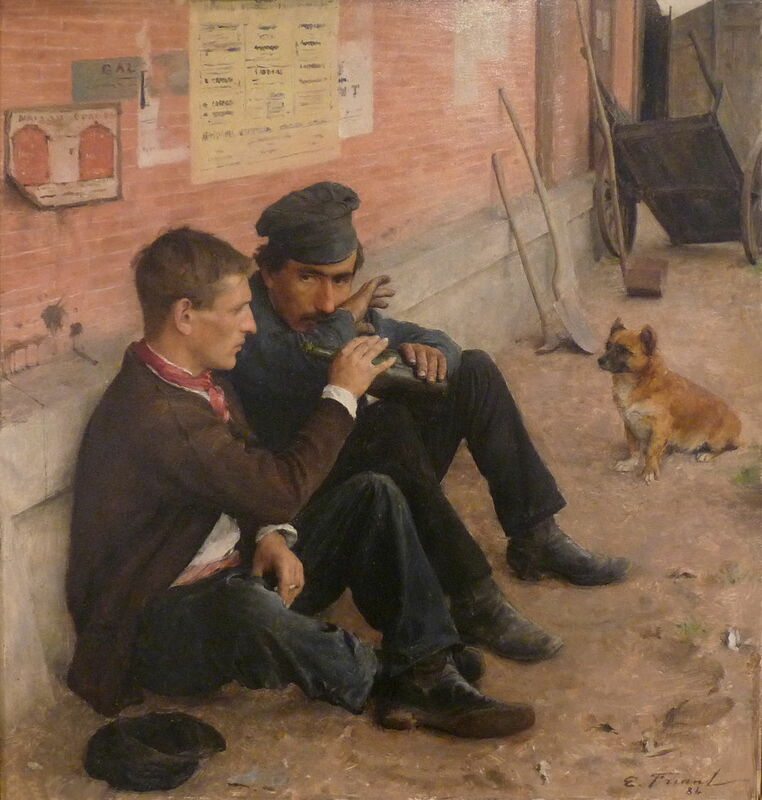 The Drinkers, or Monday’s Work (1884) is one of his first ‘social realist’ paintings, showing two unemployed and unskilled men sat drinking together against an exterior wall. The hands of the more distant man are conspicuously grubby and unkempt, and the small dog looks on accusingly. Émile Friant (1863–1932), Portrait of the Sculptor Ernest Bussière (1863-1913) (1884), oil on canvas, dimensions not known, Musée des beaux-arts de Nancy, Nancy, France. Wikimedia Commons. 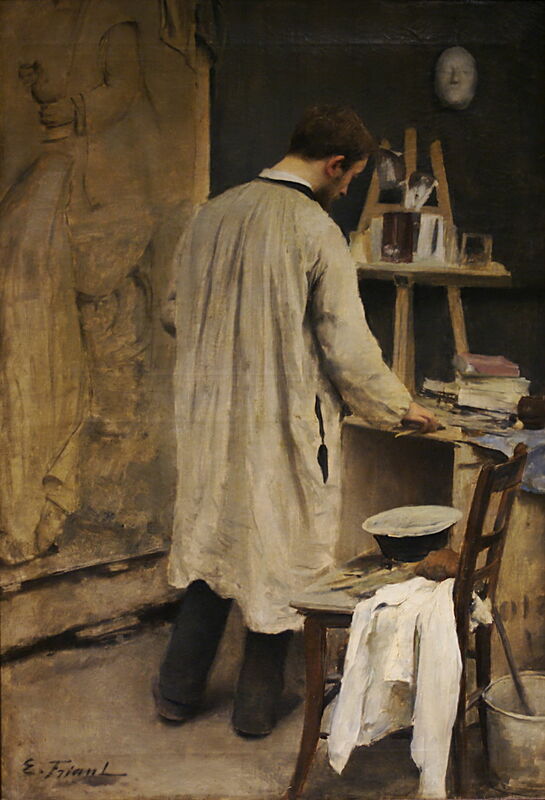 During these early years of his career, Friant painted his own and other studios, including this Portrait of the Sculptor Ernest Bussière (1863-1913) in 1884. 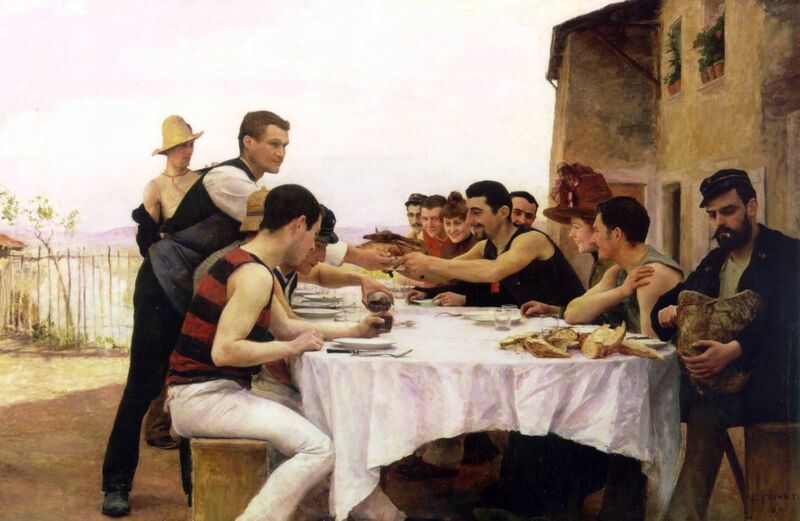 In 1885, Friant met a future patron, the successful comedian Constant Coquelin and his theatrical family, who worked with actress Sarah Bernhardt, who in turn had been friends with Jules Bastien-Lepage. But Friant’s career was interrupted by his compulsory military service until the following year. After that, he was awarded funds to travel, and visited Belgium and Holland. In the Spring of 1887, he went to Italy and Tunisia, and Coquelin took him on to visit London with him. Émile Friant (1863–1932), Young Woman of Nancy in a Snowy Landscape (1887), oil on canvas, dimensions not known, Musée des beaux-arts de Nancy, Nancy, France. Image by Ji-Elle, via Wikimedia Commons. Friant painted several works which are now valued for their regional interest. 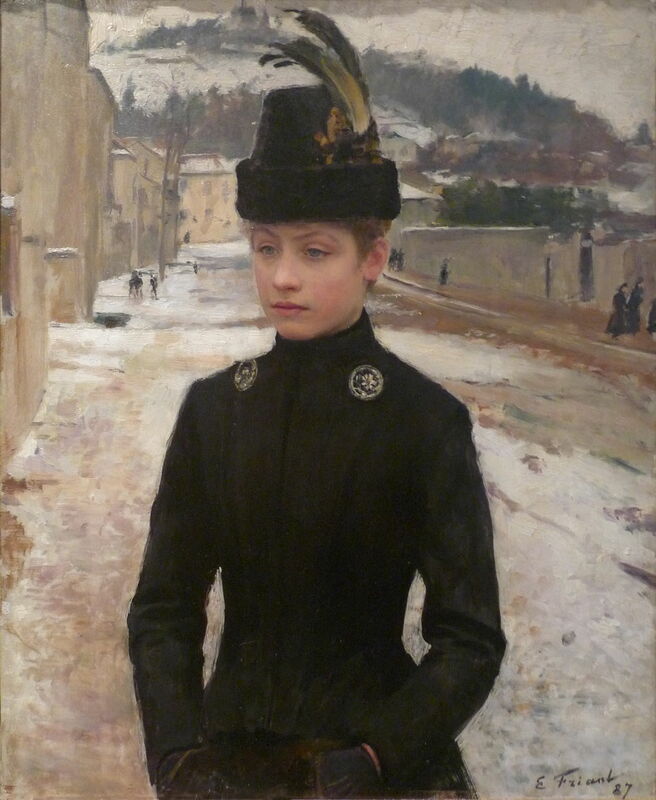 Among them is this portrait of a Young Woman of Nancy in a Snowy Landscape from 1887. This follows the compositional formula which had been popularised by Jules Bastien-Lepage, with its very high horizon, careful foreground detail, and more painterly background. However, his subject here was very different from Bastien-Lepage’s poor children. The Meurthe Boating Party, also known as Reunion of the Meurthe Boating Party or The Oarsmen of the Meurthe, from 1887 is one of Friant’s first key works. It shows the artist’s watersporting friends eating a meal together on the river Meurthe in Nancy. Friant was an enthusiastic participant in several watersports, including rowing and canoeing. This painting can be read as a broad message of well-being and conviviality: healthy, fit young men engaged in team sports; fraternity; and harmony across different classes within society. It was exhibited at the Salon in 1888, and as a result of its success there was featured as a full page in the popular magazine Le Monde Illustré, bringing Friant instant fame across the country. Émile Friant (1863–1932), Self-portrait in Light Grey (1887), oil on canvas, 35.5 x 28 cm, Musée des beaux-arts de Nancy, Nancy, France. Wikimedia Commons. 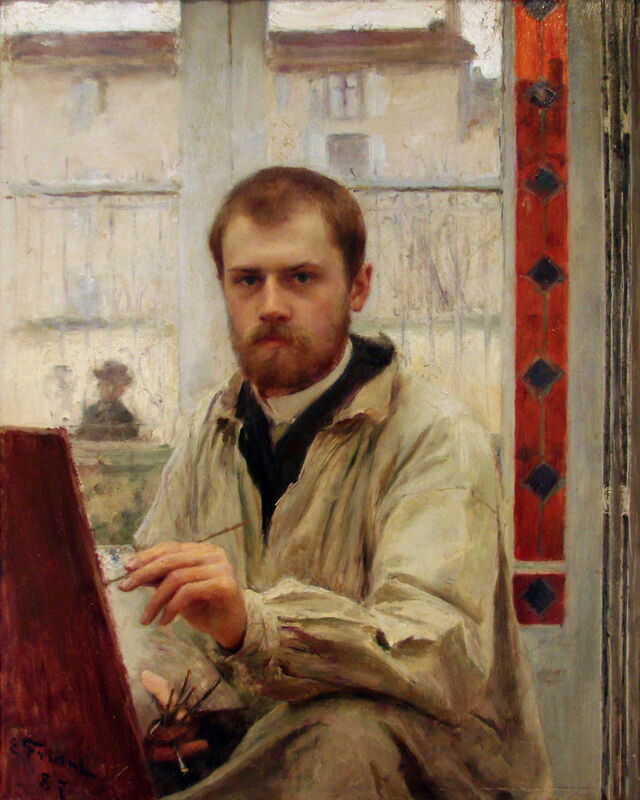 Friant’s Self-portrait in Light Grey (1887) shows the artist as a young man (24) in his studio in Nancy. Émile Friant (1863–1932), Spring (1888), oil on panel, 24 × 31 cm, location not known. Wikimedia Commons. Spring (1888) shows a young man, standing in a barn, talking to two young women, who are walking with their arms around one another. It has a curious detail of the small trap-door just to the right of the man, which presumably marks the entrance to a kennel, but there is no dog. 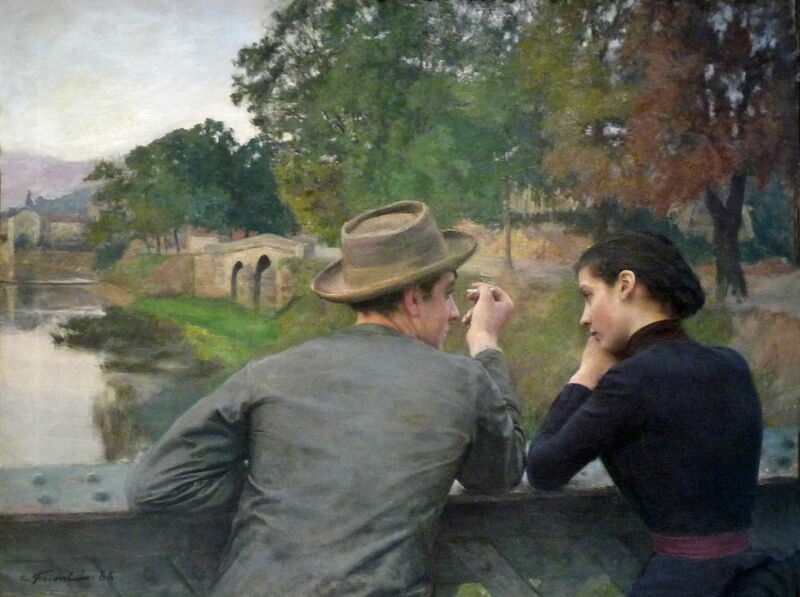 Émile Friant (1863–1932), The Lovers (Autumn Evening, Idyll on the Bridge) (1888), oil on canvas, 111 × 145 cm, Musée des beaux-arts de Nancy, Nancy, France. Image by Ji-Elle, via Wikimedia Commons. Much more successful was Friant’s The Lovers also known as Autumn Evening, or Idyll on the Bridge of the same year. His lovers contrast with Bastien-Lepage’s Love in the Village (1882), though: both are well-dressed, and there is no doubt about their maturity, and the propriety of their relationship. Émile Friant (1863–1932), All Saints’ Day (1888), oil on canvas, 254 × 334 cm, Musée des beaux-arts de Nancy, Nancy, France. Wikimedia Commons. 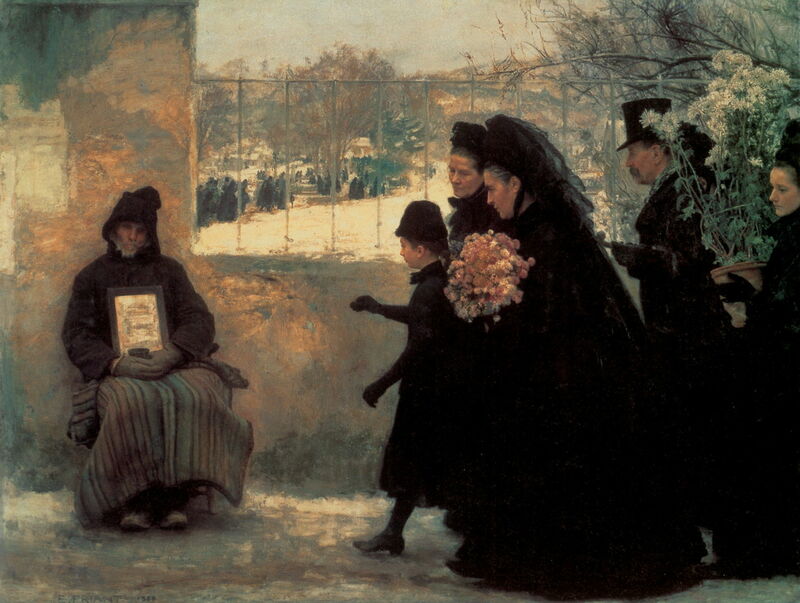 Friant’s next major work was All Saints’ Day (1888). This shows a young girl about to give a blind beggar a coin, as her family passes on their way to pay their respects at the Nancy municipal cemetery, the conventional activity on All Saints’ Day. In the vaguer distance, there is a dense procession of similar families clad in black, making their way through the cemetery. It was exhibited at the Salon in Paris the following year, and won a gold medal at the Exposition Universelle later that same year. It has photographic traits in its composition, being a seized moment, which crops through the figure at the right edge, with a background that is blurry and lacking the same crisp detail as its foreground. Its central gap, between the donor and recipient of charity, marks the gulf between their status. Posted in General, Life, Painting and tagged Bastien-Lepage, Cabanel, Friant, naturalism, painting, realism. Bookmark the permalink.